As mentioned previously, France has always had a special place dans mon coeur. 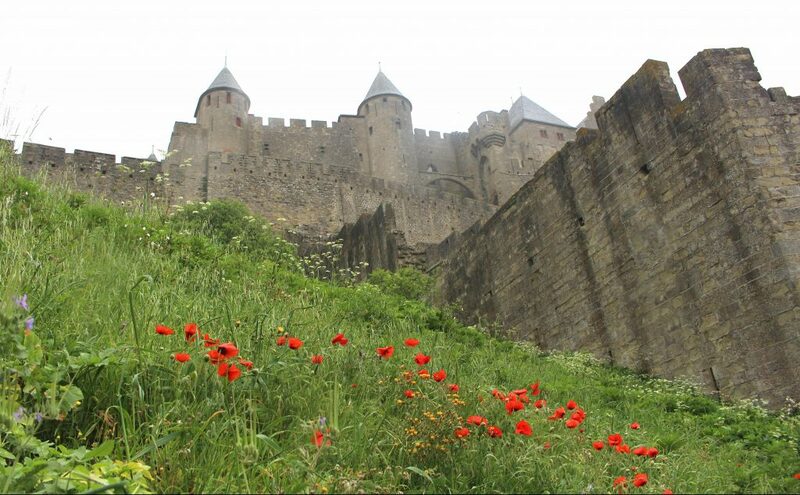 Today I will share a little of about my time in the medieval walled city Carcassonne. If you’re planning a trip here (and why wouldn’t you be), you can fly directly and cheaply to Carcassonne from London and Manchester with Ryan Air. Flight time is 2 hours. This photo below is the view from our hotel window. Pas mal du tout! 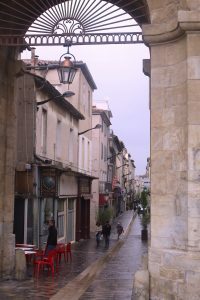 There are two main areas to visit within Carcassonne: the old fortified medieval walled city – La Cité – and then the more modern part of town, Bastide Saint Louis, over the bridge. This is not so busy with tourists and you can find plenty of great eateries (impossible not to in la France), boutiques and good people watching. You can also take some fabulous photos from the Pont Vieux bridge, looking back towards La Cité. The medieval walled city is stunningly preserved, so much so, that it looks like something out of Disney! It is truly enchanted. As you are driving towards Carcassonne, it’s something special to see its profile against the skyline. I felt like an excited 6 year old as we drew closer, wondering if the buildings had been superimposed. You can’t drive inside the walls. We left our car in a car park at the entrance and then were collected by the hotel concierge. We were greeted at the entrance, by La Dame Carcas. Whilst we stayed, it was a moody, overcast May but that only served to add to the eerie atmosphere in the cobbled streets. We spent 3 nights here, which was perfect for a short break, romantic or otherwise. I really do love Europe for its ability to transport me on every level, to another time and space. The atmosphere and the architecture is so evocative, that it gets the imagination working overtime! I love it! I have missed this, with living in Australia and appreciate it so much more now when I visit. Yes there is so much history in Australia too, but there’s a long way to go with the shameful past, in relation to the treatment of its Indigenous population. Anyway that’s another story, so back to France for the moment. 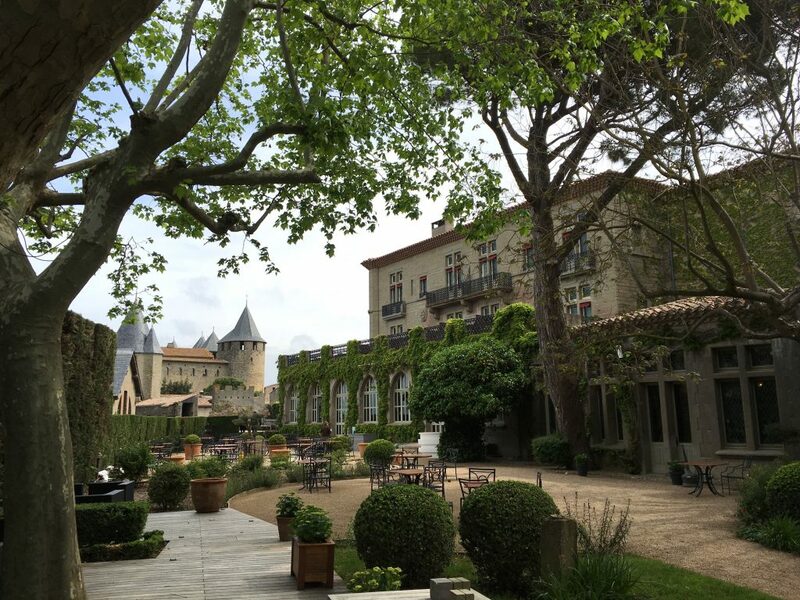 We stayed at the magical Hotel de la Cite. For somewhere to stay for just a few special days, I can’t recommend this place highly enough. (No this is not a sponsored post!) I will definitely stay here again and I know, I will return. It is THE best spot and made me feel as though I had moved back into a past life. I had the most vivid dreams of being Jewish and living in the area, whilst staying there. I’m not joking. The cobbled streets were so familiar. Lunch onsite at the hotel at Jardin de L’Eveque (pictured above) is very pleasant with its views overlooking the ramparts, beautiful rose garden and view down to the River Aude. We had one of those special moments in time one afternoon, where we had the place to ourselves with a chilled glass of local Rosé – perfection. We also wandered through the divine gardens. There is also a gorgeous pool but we didn’t have swimming weather! There is also an award-winning Michelin starred restaurant. ‘La Barbacane’, in Hotel de la Cite, which looks very impressive if you fancy some haute cuisine. No doubt un peu cher, but formidable nonetheless. 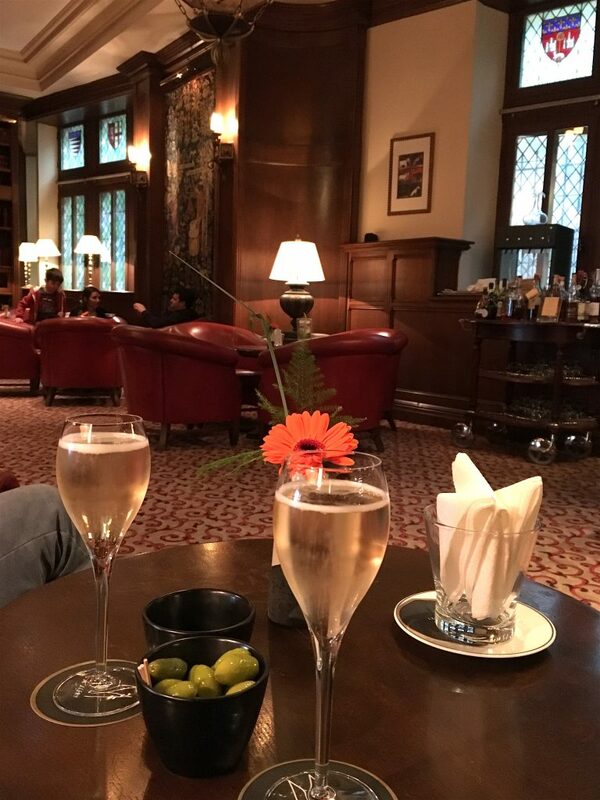 We enjoyed an aperitif a couple of evenings in the bar, which is like sitting in an old library. The best way to get a decent rate is to sign up for a free membership with Accor Hotels, who have numerous well-known hotel chains all over the world. Then you can compare prices. I was lucky to get a ‘pay for 2 nights, stay for 3’ offer so it was a real treat. Good luck! The hotel is part of MGallery, which is one of my favourite boutique hotel chains around the world. Whenever I am travelling now, I have a look on Accor and see if there is an MGallery in that location and what the deals are. I have stayed at them in Australia, New Zealand, France, Bali and plenty more to come! It is not a budget hotel, so if that’s what you’re looking for, do a search on Trip Advisor for any current special offers. 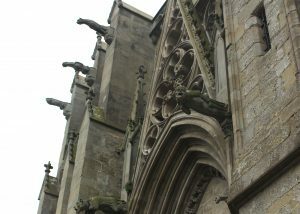 The Basilica did not disappoint with the scary gargoyles and their tortured expressions, scowling down at us. Place Marcou, close by, is the square in the centre of La Cite and there are plenty of outdoor cafes and special deals for “Petit Dejeuner” which usually consists of coffee, orange juice, croissant and other pastries, for between 6-10 EUR. Breakfasts in most hotels tend to be overpriced. I prefer to go for a stroll, soak up the local atmosphere and plan for the day in a local cafe. We sat and had coffee at Le Trouvere and Le Marcou a couple of mornings as we watched the world go by. My only complaint whenever I travel in Europe is that I forget how many people smoke, until I’m back there the next time. So that can be annoying when you are inhaling your neighbour’s smoke, at the same time as your croissant. Ah c’est la vie! So you may have to be strategic with where you choose to sit. After searching through TripAdvisor I found some great reviews of Restaurant Adelaide, so we decided to give it a try. We were not disappointed and returned a few times. Generous portions, gorgeous fare, friendly staff and efficient service. Also very cosy and welcoming inside, particularly on a blustery day. They serve local, organic wine, which you will recognise by the word ‘Bio’ on the label. There is an abundance of organic food and wine in the area so the local gourmet experiences do not disappoint. One of the local specialities in the region is cassoulet that many rave about! Being a vegetarian I can’t comment on it, but it is certainly a popular dish here. I came across this food guide that you can download, so this will also give you some ideas, when you are booking your trip. 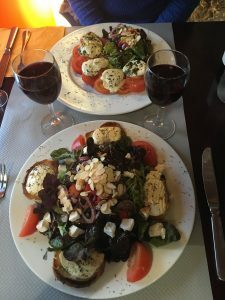 There’s plenty of choice in France, so no matter what your culinary preference is, you will have options. One of my biggest issues in France is that I can’t stop eating and drinking! When I was an au pair in Paris when I was 19 years old, I managed to accumulate an additional stone in weight in 4 months. It was created purely from baguette, brie and eclairs. It soon disappeared once I went back home to reality, but oh how I enjoyed the ‘creation’ of that extra weight. 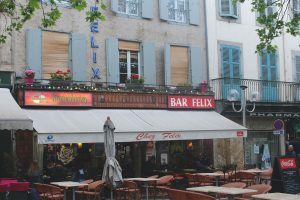 Cafe Felix is a central spot for people watching and mainly filled with locals having their plat du jour. Simple fare and good value for money. We enjoyed brunch here one morning. It’s all about the blue shutters obviously! An omelette will not set you back too much and it’s more of a place for locals, rather than tourists. Or that is how it seemed to us. This photo was taken just prior to a crazy downpour that seemed to come from nowhere, and then cleared up just as quickly. That’s May showers for you. I always feel that May and September/October are the best times of the year to visit Europe, as you are avoiding the peak Summer season for tourists. of a trilogy, set in the Languedoc region in France. I ‘randomly’ saw this book in a store in Hawaii, a few months before my trip. I was surprised to see that it was set in Carcassonne and so I bought it and held onto it, to read specifically on my trip there. One of my genius ideas. It was amazing to immerse myself in the story, whilst actually being there – so I highly recommend. It brought the story to life. Kate, a British writer and editor, apparently lived part of the year in Carcassonne, whilst she was writing the book. Her love of the place really shines through. I loved it! Order here for free worldwide postage. 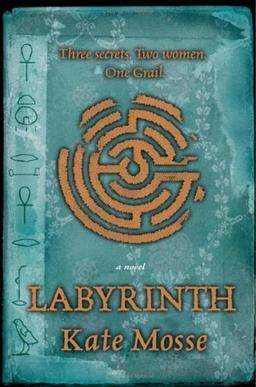 Labyrinth is an archaeological mystery English-language novel written by Kate Mosse set both in the Middle Ages and present-day France. It was published in 2005. The story of Labyrinth moves back and forth between two time zones and characters. Present day with Alice Tanner and then back to the 13th Century at the time of the Cathars persecution with Alais Pelletier. More about the Cathars, in Part 1. 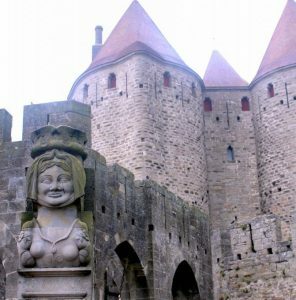 Kate also created a guided walk around Carcassonne that you can download in a PDF document from her site here. Hotel de la Cite is point 5 on the walk. It’s very comprehensive. The book retells the horrendous ordeal suffered by the Cathars at the hands of the Inquisition by the Catholic Church. You can also see so much of this grisly history portrayed in wall murals, art work, stained glass windows and the symbol of the fleur-de-lis. There is mystery, murder and intrigue. A real page turner! Whilst you’re at it, you may as well get onto the other two books in the trilogy! So you can order “Sepulchre” and “Citadel” too. I have always been fascinated with labyrinths and reading this galvanised me to take action and book into for the Labyrinth Facilitator Training taking place at Chartres Cathedral later on in the year with Veriditas. 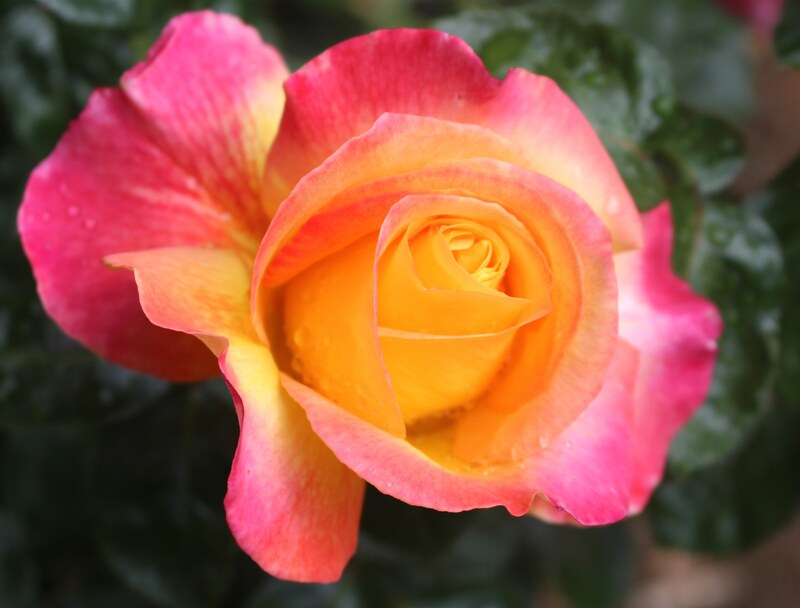 I will share my experiences in Sacred France – Part 3 coming soon. If you have not yet read it, check out Sacred France – Part 1. 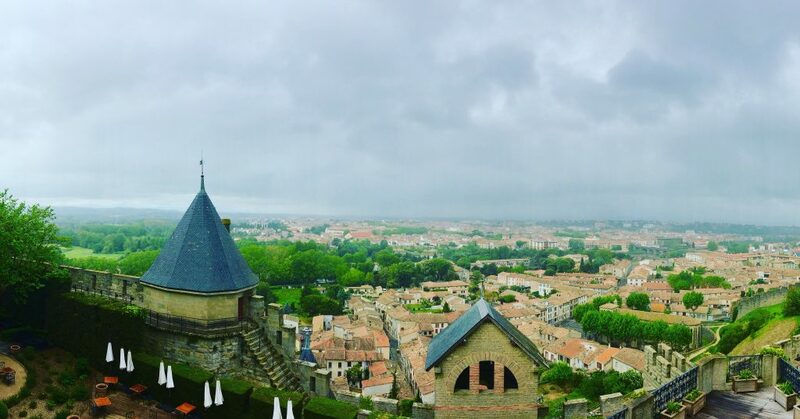 Have you already been to Carcassonne? What did you love about it? Have you read the books by Kate? I would love to hear in the comments box below.